Click here to view this article in Spanish! Haga clic aquí para ver este artículo en español! I've always thought that the atractaspids were a highly interesting group of snakes, deserving of an article or two. 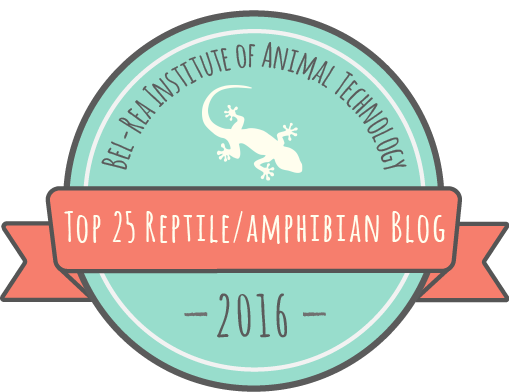 During the early stages of my cursory research, however, I found that palaeozoologist Darren Naish, author of the excellent blog Tetrapod Zoology, has already written an article containing what one commenter called "the most comprehensive information on Atractaspids anywhere on the web." Since I didn't think I could top that, I decided to focus on what we've learned about atractaspids since Darren's article came out in 2008. If you want to learn more about the many fascinating adaptations atractaspids have evolved for burrowing and closed-mouth fang-stabbing, including why they're known as والد من سواد ('father of blackness'), among other such macabre names, in Arabic-speaking countries in their native range, you'll want to read that article in addition to this one. The correct placement of the atractaspids within the snake tree of life has been elusive since their initial description in 1843, when they were placed in the Elapidae alongside cobras and coralsnakes. In later classifications, they have been placed in the Viperidae, the Colubridae, the Lamprophiidae, or in their own family, to which various names have been applied, including Atractaspidae (atractaspids), Atractaspididae (atractaspidids, because why not add in an extra 'id'? ), and Atractaspidinae (atractaspidines; this last name referring to a subfamily rather than a family). Once considered to include a wider diversity of snakes, the Atractaspidinae is now comprised of just two genera, the proteroglyphous Homoroselaps (2 species, known as Harlequin Snakes) and the eponymous, solenoglyphous Atractaspis (21 species). Aglyphous and opisthoglyphous snakes formerly included in this group are now assigned to a closely related subfamily, the Aparallactinae, which includes 50 species in nine genera, several of which are deserving of their own articles. This taxonomy is based on part of a larger analysis of advanced snakes undertaken by Alex Pyron and colleagues and published in 2010, and hinted at in earlier analyses such as this one by Kraus & Brown. Part of the tree presented in Pyron et al. 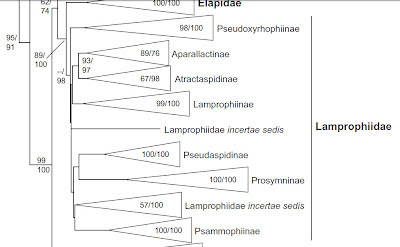 2010, showing the relationships of atractaspids to other African snakes now placed in the Lamprophiidae. 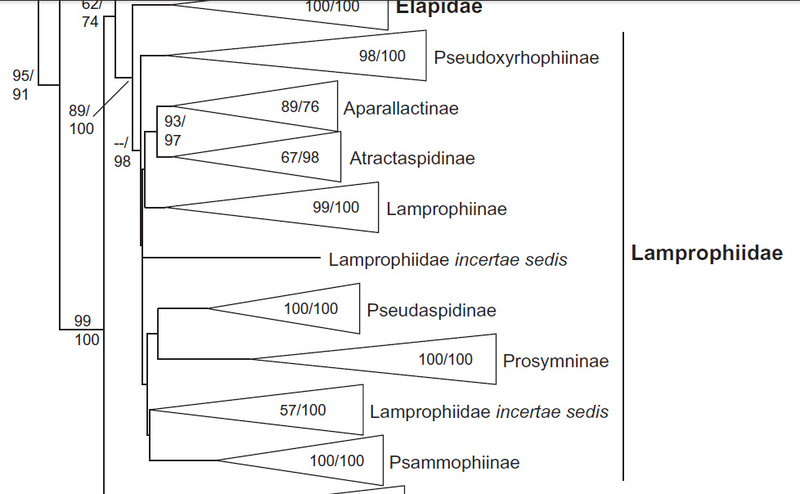 A surprising finding of this paper was that lamprophiids share a common ancestor with the front-fanged elapids, including cobras, sea snakes, and coral snakes, about 44 million years ago. Morphological work on atractaspids has continued to be carried out by Dave Cundall and his students and colleagues at Lehigh University. I had the opportunity to hang out with Dave a bit recently, and he shared some of his recent findings with me. For instance, he said, the long-held idea that Atractaspis fed predominantly on litters of baby mammals might be only party true. The stomach of some atractaspids, he told me, is almost as long as the entire body, an adaptation that could be construed as functioning to accommodate multiple prey items (pups in a litter) but also large, elongate ones (such as amphisbaenians or caecilians), which also frequently occupy underground spaces where hunting by fang-stabbing is effective. 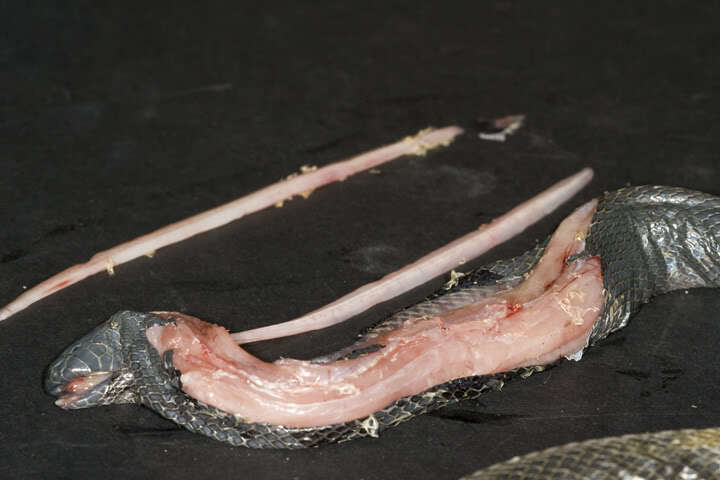 Dave also mentioned that digestion in these snakes takes place, as one might expect, only in the stomach, not in the esophagus, although ingested prey may extend forward into the esophagus if they are too large to fit in the stomach. Differences in the tissue lining these two parts of the digestive system account for a pH change of up to 4 units between the esophagus and the stomach, one of the few clues that these two organs in snakes are derived from separate structures in other vertebrates (since their morphological separation in many snakes is subtle at best). 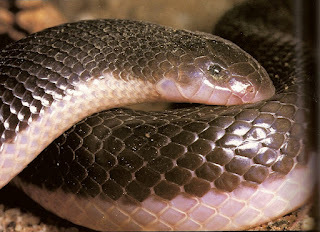 Other discoveries made by Dave and his student Alex Deufel, including how atractaspids, perhaps uniquely among advanced snakes, have traded-off prey transport for maximum fang-stabbing ability, have been described in excellent detail by Darren at TetZoo. No one is quite sure why, but some Atractaspis also possess extremely elongate venom glands, such as those seen here in a dissected A. fallax. Other recent work on atractaspids includes advances in understanding their unusual venom chemistry and in treating its effects, including the discovery and production of the first atractaspid antivenom in 2007. In a test of this antivenom conducted at the National Antivenom and Vaccine Production Center in Riyadh, Saudi Arabia, rabbits injected with a lethal dose of Atractaspis venom were saved from death by a pre-injection treatment of any one of three drugs: nitroglycerin, atractaspid antivenom, or bosentan, a drug for the treatment of pulmonary hypertension. However, when the drugs were administered after the venom, as would be the case in an actual snakebite, all rabbits treated with nitroglycerin and half the rabbits treated with atractaspid antivenom died. Only the hypertension drug bosentan protected rabbits from the venom in the realistic scenario, leading the author to conclude that bosentan might have a higher affinity to the venom receptors than either the antivenom or the venom compounds themselves. Finally, a 2011 study by Katie Moyer and Kate Jackson of Whitman College helped initiate our understanding of how the 21 species of Atractaspis are related to one another. Remarkably, this is the first time someone has investigated this question, and because Moyer & Jackson used morphological data, there are likely to be some changes once DNA sequences for these species become available. Using characteristics of the scale arrangements, they prepared an evolutionary tree that differed from all previous hypotheses about how the species of Atractaspis are related. Although their analysis is limited by the paucity of available data, it represents a starting point for understanding the evolution of this highly unique group of snakes. Thanks to Michael & Patricia Fogden and Donald Schultz for photographs. Abd-Elsalam M, 2011. Bosentan, a selective and more potent antagonist for Atractaspis envenomation than the specific antivenom. Toxicon 57:861-870. Bourgeois M, 1961. Atractaspis – a misfit among the Viperidae? News Bulletin of the Zoological Society of South Africa 3:29. Deufel A, Cundall D, 2003. Feeding in Atractaspis (Serpentes: Atractaspididae): a study in conflicting functional constraints. Zoology 106:43-61. Greene HW, 1997. Snakes: The Evolution of Mystery in Nature. Berkeley: University of California Press. Ismail M, Al-Ahaidib M, Abdoon N, Abd-Elsalam M, 2007. Preparation of a novel antivenom against Atractaspis and Walterinnesia venoms. Toxicon 49:8-18. Moyer K, Jackson K, 2011. Phylogenetic relationships among the Stiletto Snakes (genus Atractaspis) based on external morphology. African Journal of Herpetology 60:30-46. Naish D, 2008. Side-stabbing stiletto snakes. Tetrapod Zoology. Pyron RA, Burbrink FT, Colli GR, de Oca ANM, Vitt LJ, Kuczynski CA, Wiens JJ, 2010. The phylogeny of advanced snakes (Colubroidea), with discovery of a new subfamily and comparison of support methods for likelihood trees. Mol Phylogenet Evol 58:329-342. Hm, I'm not sure I've heard of that before. Their venom chemistry is definitely unusual, but I can't claim to be even close to an expert on that kind of thing. 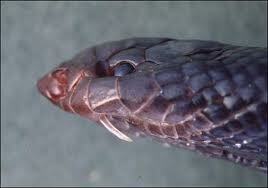 From what I understand, the effects of a venom have at least as much to do with the patient as with the snake. However, there are definitely some resources available - a few peer-reviewed articles that I was able to find suggested that the lethality of atractaspid venom was primarily cardiotoxic (Weiser et al. 1984, Lee et al. 1986).